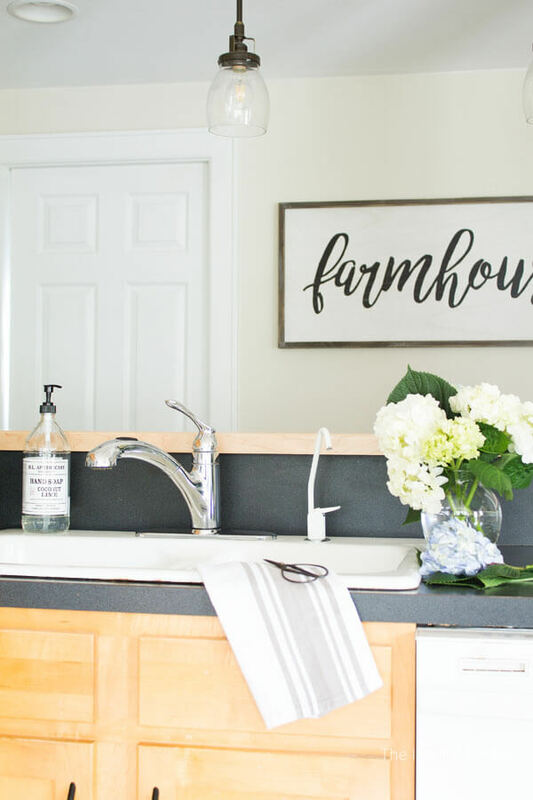 I always thought I wanted a white farmhouse sink... until we moved into this house! 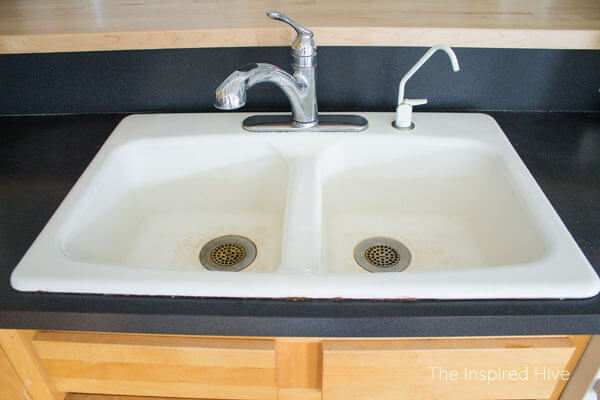 It has an almost 25 year old white porcelain enameled cast iron drop-in sink in the kitchen. From afar, it's beautiful. But when we moved in, it was so stained and dirty that I thought I wanted to get rid of it ASAP! I have tried everything to clean this sink over the past few months. 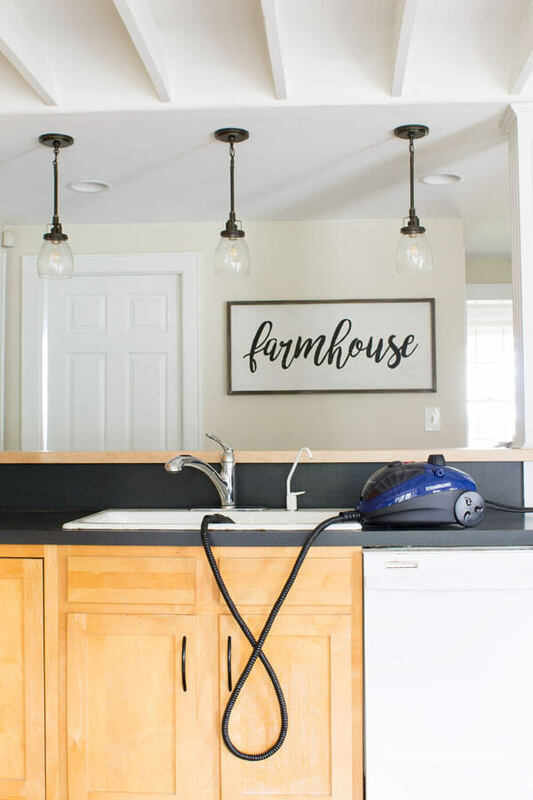 No matter how much elbow grease I put into it, I could not remove the stains that had settled into the surface scratches from normal wear and tear over twenty-something years. 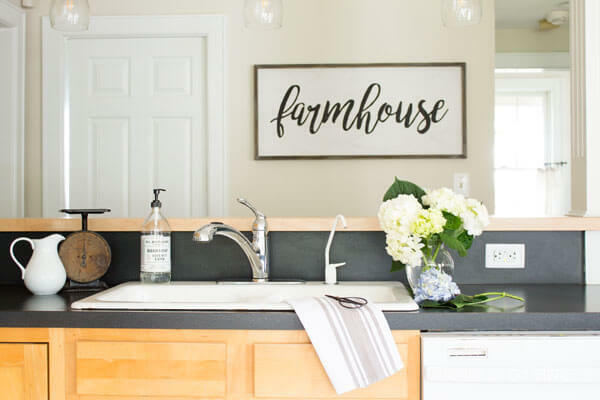 Well, I'm excited to say, I finally found a solution, and I will not be getting rid of our farmhouse sink just yet 😁 Add this to your spring cleaning routine for an almost new enamel kitchen sink! 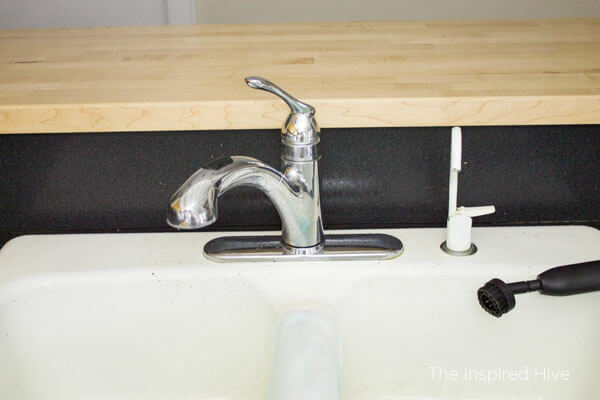 I tried everything to get our cast iron sink clean, including some chemical cleaners that I later learned I should not have used! Our sink was manufactured by Kohler and shows a date of 1995 imprinted in the iron underneath it. Naturally, being so old, it has lots of surface scratches from years of use. 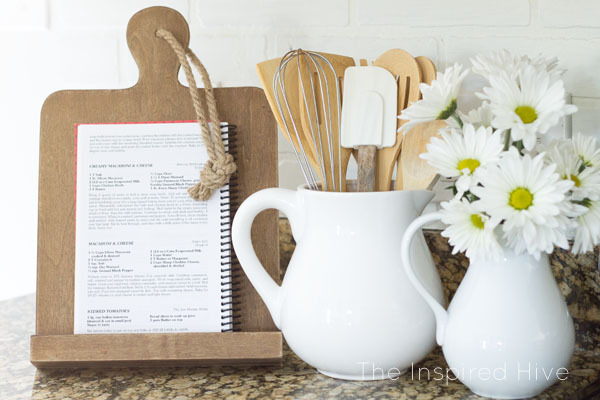 The scratched areas hold stains much easier than the enameled surface does. Those scratches held some very deep set stains. After trying what seemed like everything, I decided to combine a few different methods, all of which were safe for the enamel finish: Baking soda, dish soap, distilled white vinegar, and hot steam. 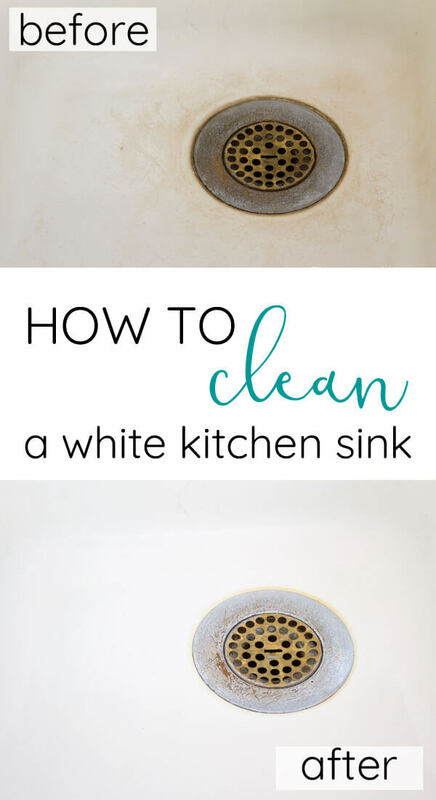 Start by using a steam cleaner to remove surface stains in the bottom of the sink and to start loosening some of the deeper stains. 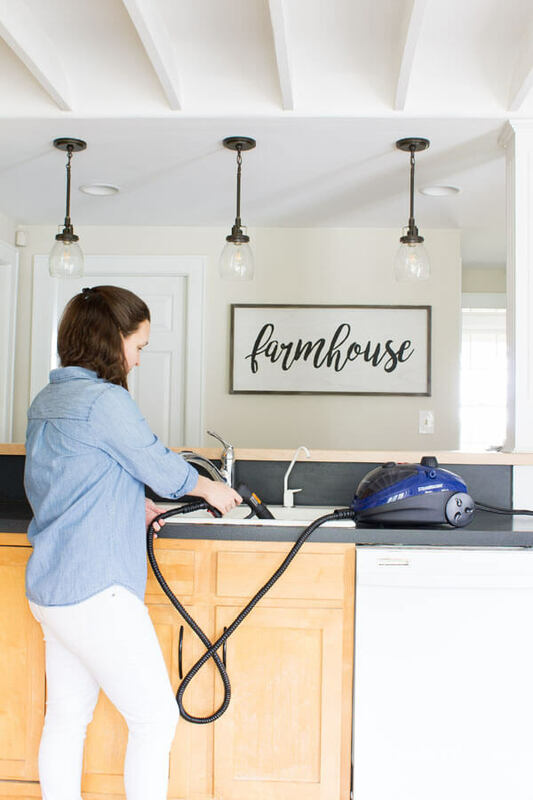 Heat truly works wonders for cleaning (plus it sanitizes without harsh chemicals). I love my HomeRight Steam Machine. I've used a smaller cleaner in the past, but this one has an extra long hose which makes it easy to work with, and it has attachments for every job you could think of. For cleaning the sink, I used the jet nozzle and both the small and large nylon brushes. Mix a bowl of 1:1 blue Dawn dish soap and distilled white vinegar. 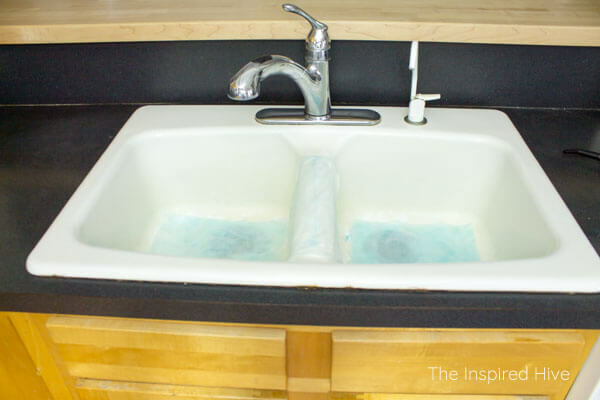 Put a paper towel in the solution, ring it out slightly, and lay the wet paper towel on the bottom of the sink (I also put one on the middle divider because it also had some deep stains). 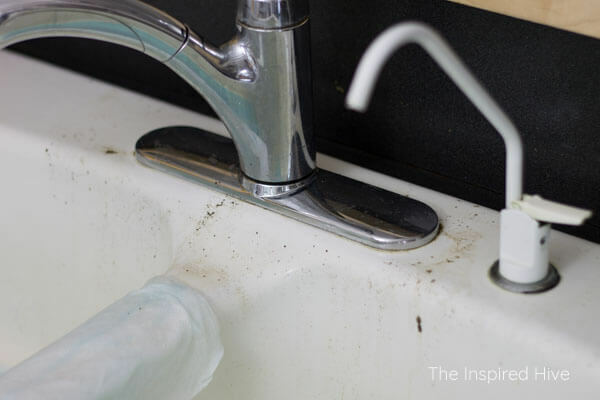 Pour any extra solution onto the paper towel on extra dirty areas (the problems areas for me were right around the drains). Allow to sit. 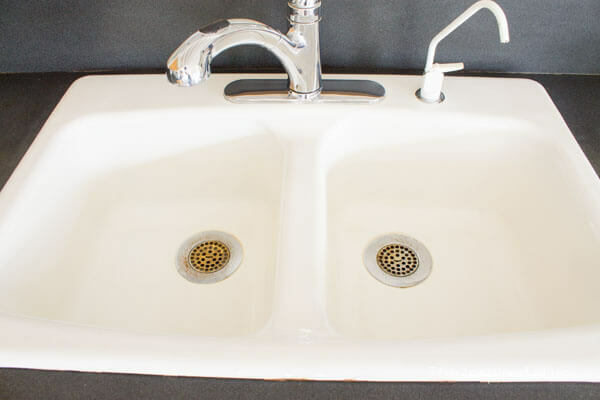 While the baking soda, dish soap, and vinegar are working their magic, use your steam cleaner to start cleaning the rest of the sink. I started with the jet nozzle and sprayed along the edges of the sink and the fixtures. Then I went back around everything with the small nylon brush. Look at all that dirt and debris! 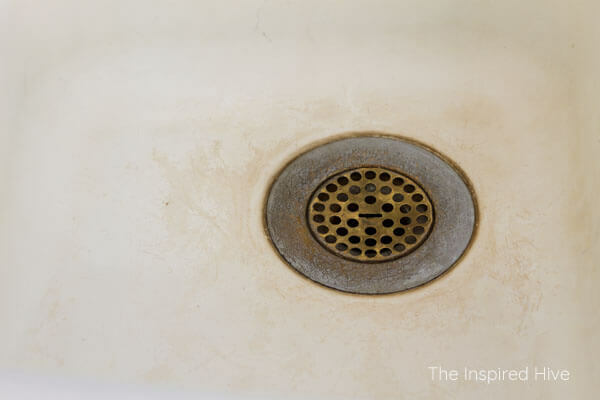 Once that was all clean, I wiped it down with a clean wet cloth and refocused on the bottom of the sink. Work one side at a time. Here's the important step! 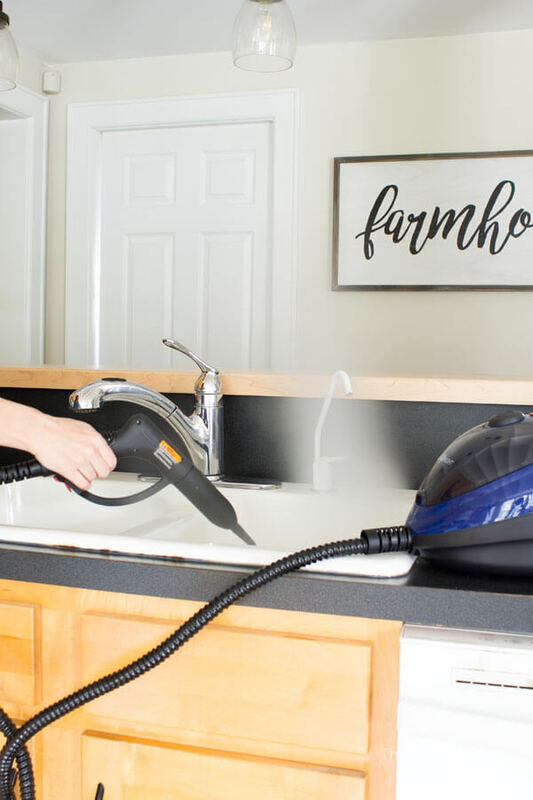 Use your steam cleaner with the nozzle attachment and steam the soap and vinegar soaked paper towels (heads up- this will smell strongly of vinegar!). This will help loosen some of those deep set stains that the vinegar mixture has been working on. Let those hot paper towels sit there another minute or so until they feel cool to the touch. Discard them. 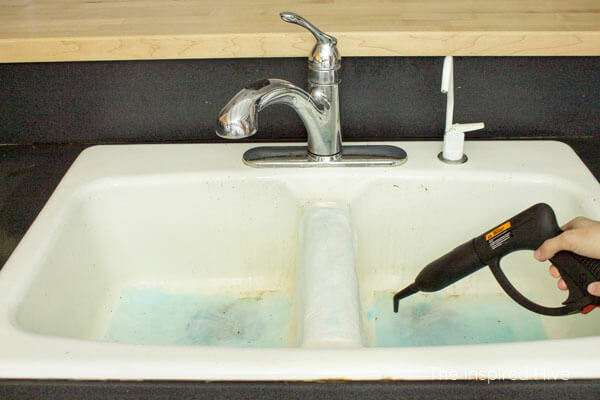 Then use the large nylon brush attachement on the Steam Machine to scrub the sink with steam. Spend as much time as you need to fully remove the rest of the stains. The stains should now come out much easier, but some areas may still take a few minutes and a bit of scrubbing with the steam. Then use the jet nozzle to run steam over the whole area one more time to sanitize. Rinse thoroughly and then repeat on the other side of the sink. I am SO amazed by how clean it is. I was seriously ready to toss this sink out the window because it looked so gross, but now other than the scratches, it looks brand new in color! 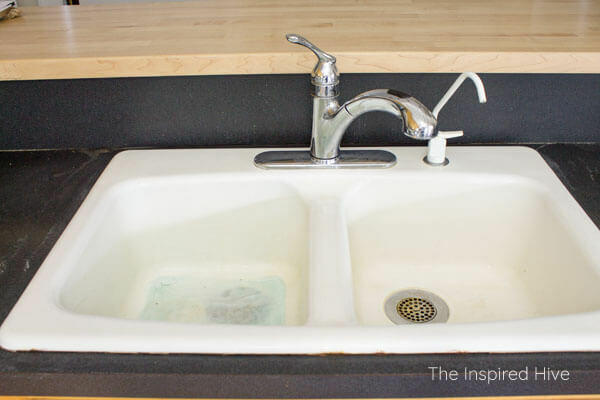 The bright white surface has me feeling inspired to restore the sink back to its original glory. I'm on the hunt for replacement drains, a new faucet and drinking faucet, and a surface repair kit for the scratches. Now that you've deep cleaned your sink and removed all of those stains, how do you keep it clean? 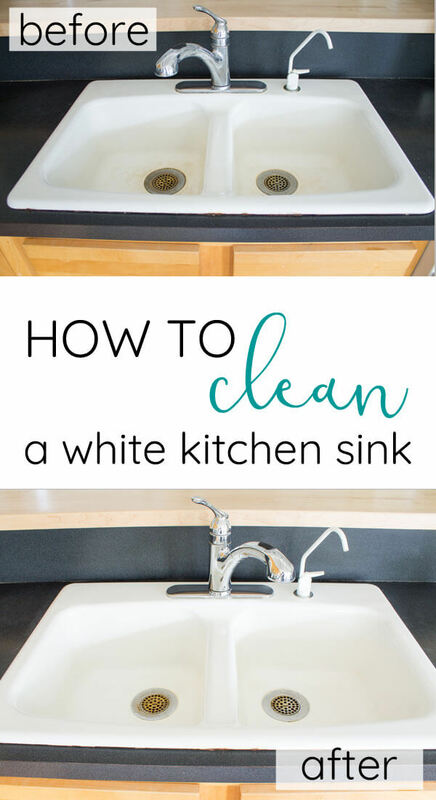 Try not to let dirty dishes sit in the bottom of the sink for too long. 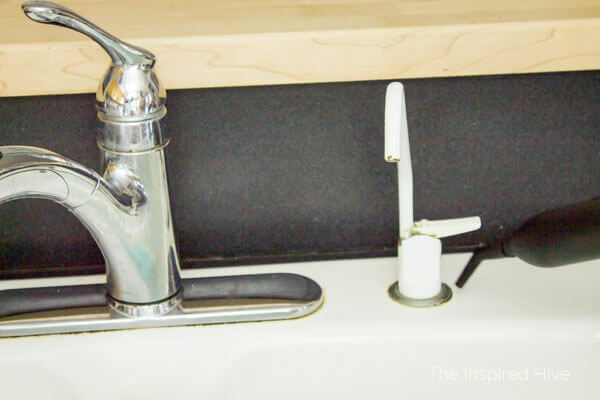 What not to use on your enamel kitchen sink! 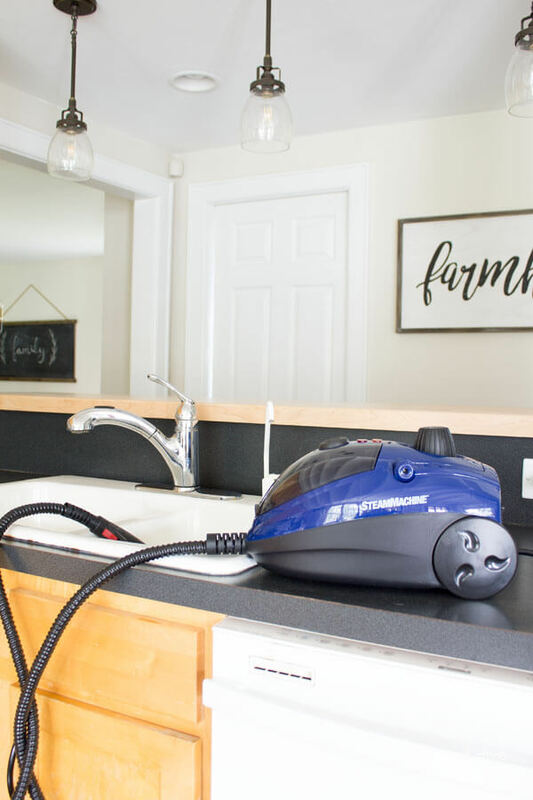 Order the HomeRight Steam Machine for your spring cleaning projects here. Pin it to your cleaning board! That's a lot of work. I simply sprinkle Bon Ami Cleaner in my wet sink. I now buy it at my Ace Hardware and it is very inexpensive. I have been cleaning our cast iron/enameled sinks and bathtubs with this since I was doing household chores as a girl in the 1970's. It is a cleaner that has been around since 1886 (says that on the container that's why I know). 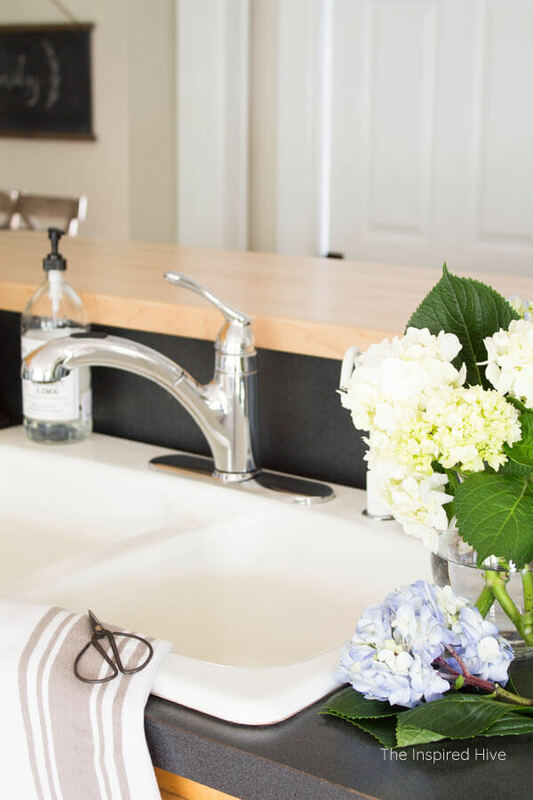 I have a white porcelain sink today and still use it. No scratches yet and I have had my sink for 7 years. If there is a stain, simply wet it and sprinkle on the Bon Ami and let it sit a bit. Good to know. I must have misread it and thought it was every day cleaning. I too love steam- especially in the bathroom! Wow, you got my attention. Nicely done. Thanks, Ivory!! My new favorite cleaning tip!